Some Women Use Botox for Better Hairstyles - Worth It? Here are the headlines that caught our attention this week. Because even during Happy Hour, the NaturallyCurly editors are still discussing all things hair. In the name of love, this real life Rapunzel chopped and donated her locks. 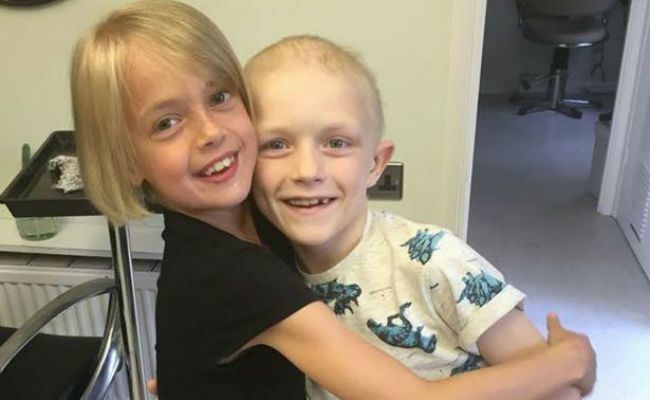 After finding out her seven-year-old friend Aiden Selleck is battling a massive brain tumor cancer, nine-year-old Libby Tucker-Spiers agreed to chop off 11 inches of hair and started fundraising in efforts of saving her "boyfriend." An all Black women cast of models slayed W Magazine's latest spread. Ajak Deng, Amilna Estevao, Anais Mali, Aya Jones, Binx Walton, and Tami Williams undoubtedly killed their photo shoot for W Magazine's August 2015 edition. All models rocked their natural hair texture and wore matching ensembles to further enhance their collective awe-inspiring beauty. The answer for a longer lasting blow out? Botox, of course. Body modification seems to be the norm for the sake of beauty these days--even if it's potentially harmful to one's health. Though still not approved by the FDA, some women are opting for Botox injections to their scalp in order to preserve their hairstyles. Health risks, $2,000 and the pain of 100 shots into your scalp -- worth it? Ashley Tisdale recently posted this photo on Instagram of the latest trending "bronde" hair color. A mixture of brown and blonde, if you hadn't guessed. What do you think, is bronde a thing? Is the "man perm" making a comeback? Buzzfeed just debuted this new video by actors Nick Savage, Scott Tammel, and Emina Mila. All we saw was headfuls of perm rollers followed by a brief social experiment via walking outdoors and were intrigued immediately.